Liverpool have now scored 1,000 goals at Anfield in the Premier League, following Saturday’s 4-3 win over Crystal Palace. Here are some of the best. The Reds edged out a spirited Eagles side at the weekend, continuing their stunning run of not dropping a point to a team outside the top five this season. Roberto Firmino put Jurgen Klopp‘s side 2-1 up early in the second half, and while it was vital in its own right at the time, it was also a significant moment in Liverpool’s history. The Brazilian found the bottom corner of the Kop net via a helpful deflection, notching up 1,000 home Premier League goals in the process. It certainly wasn’t the most glamorous strike by Firmino, particularly when you compare it to some of the 999 that came before it. The club’s official YouTube channel has uploaded an entertaining video picking out some of the standout goals over the past 27 years. It all started off with Mark Walters, who netted Liverpool’s first-ever Premier League goal at home against Sheffield United, back in 1992/93. A sensational solo effort from Robbie Fowler against Aston Villa is a forgotten gem, while it is no surprise to see Stan Collymore’s stoppage-time winner that beat Newcastle included. Steven Gerrard features prominently, with stunning hits against Southampton, Man United and Middlesbrough all selected. John Arne Riise’s free-kick at home to United remains one of the great Anfield goals, as is Xabi Alonso’s audacious halfway-line strike that stunned Newcastle. In terms of modern-day efforts, Daniel Sturridge‘s magical lob against West Brom in 2013/14 is well worthy of its inclusion. 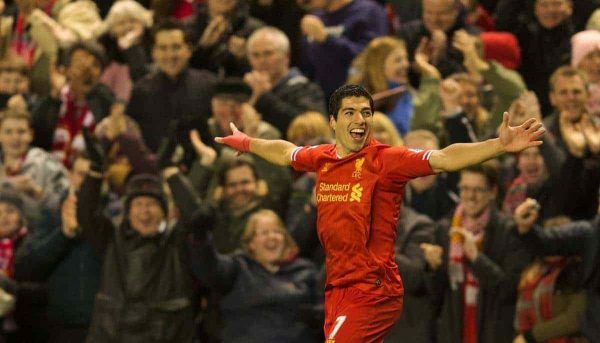 So too is Luis Suarez’s opener against Norwich in the same season, on a night when the Uruguayan produced one of the greatest individual performances ever seen at Anfield. It is a brilliant watch for any Liverpool supporter, reminding us all of how many special moments there have been to treasure in the Premier League era. That elusive league title continues to evade the Reds—is this the season that finally changes?